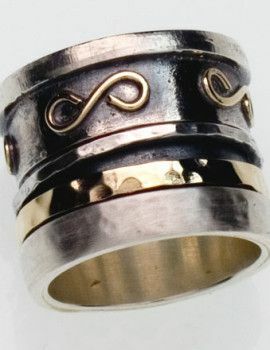 Spinner rings for woman and man. Vintage Inspired Spinner ring Spinner Ring for Man / spinner ring for woman / silver gold 9ct Two Metals Ring. Spinner Ring for Man and Woman silver gold 9ct . Designer Jewelry. The ring has different texture bands in 3 colours: oxidized silver, silver, yellow gold. The ring is about 1.9 cm wide. Spinning rings made in silver & gold are famous from Australia to California, from Madrid to Stockholm.